Researchers at Indiana University have developed a search engine, Hoaxy, to demonstrate how fake news and unverified stories spread through social media, after showing how they generated revenue from advertising based on the misinformation. Filippo Menczer, the director of the university's Center for Complex Networks and Systems Research, is heading the joint project between the university and the Center for Complex Networks and Systems Research. Menczer and Giovanni LucaCiampaglia, assistant research scientist at the university, coordinated the project. Along with a team, the two have created an open platform for the automatic tracking of both online fake news and fact-checking on social media. The platform tracks social sharing of links on "independent fact-checking sites like snopes.com and factcheck.org, and sources that publish inaccurate, unverified, or satirical claims "according to lists compiled and published by reputable news and fact-checking organizations," per the Frequently Asked Questions (Q&A) page on the university's site. "Social media makes it more likely that I am more exposed to false information that I am likely to believe," Menczer told Reuters. 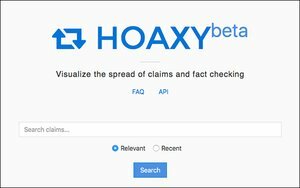 Hoaxy relies on Web crawlers to extract links to articles posted on fake news Web sites and links to their debunking on fact-checking sites. The post explains that the search engine uses social media APIs to monitor how these links spread through online social networks. The collected data is stored on a database for retrieval and analysis. A dashboard will provide interactive analytics and visualizations. Fake news also enabled Menczer and researchers to make money during an earlier research phase. Ten years ago, Menczer and colleagues ran an experiment where 72% of the college students participating in the study trusted links that appeared to originate from friends, even to the point of entering personal login information on phishing sites. He placed ads on a fake Web page that he created and populated the site with random, computer-generated gossip news. A disclaimer ran at the bottom of the page saying the site contained meaningless text and made-up facts. At the end of the month, he received a check in the mail with earnings from the ads, proving that he could make money off fake news. Google is actively working to stop fake news from appearing in search engine results and also is taking steps to stop advertisements powered by AdSense, its ad-serving platform, from serving on publisher sites known to publish fake news. 3 comments about "Search Engine Finds How Fake News Spreads (No, People Don't Search For It)". Douglas Ferguson from College of Charleston, December 22, 2016 at 12:37 p.m. This is a great reminder that filtering fake news sites does not necessarily filter out the news aggregators that link to those sites. The problem is layered upon layers; filtering the originating sites from a Google search will hardly prevent visitors to legitimate news aggregators from seeing the links. Chuck Lantz from 2007ac.com, 2017ac.com network, December 22, 2016 at 4:20 p.m. I noticed that The Onion is listed as a fake news site, which brings up the sticky issue of defining false news as either intentional satire or as an effort to deceive for gain, either political or monetary. Maybe a slight modification of the term itself would be helpful for defining the purpose behind it; ... instead of calling it "fake news", I'd suggest "faked news." Bob Gordon from The Auto Channel, December 23, 2016 at 11:54 a.m.
Google has been struggling with their search since they adopted the animal farm (panda and Penguin) algorythms ...they throw out the baby with the bathwater and invite scammers, scrapers, and neir do wells to occupy the top SERP listings... until that gets adjutcated advertisers will be unhappy with the fake clicks and phantom traffic... have a nice holiday... hopefully after 20 years on line we will still be around next year.